„The first half of the year marked the most exciting times of our young company yet. We started by moving a little less than 2 million items as well as our photo studio from our old warehouse to our new automated fulfilment centre in Ängelholm, equipped with an automated storage and retrieval system comprising of 130 robots operating on top of an eight-meter high grid containing 130,000 bins. The move was very well executed and completed ahead of time with only minor disturbances to the customer experience. Having finalised the warehouse move; the next big step was to prepare and execute the listing of the company on Nasdaq Stockholm, which took place on May 31. The listing was well received by investors, as we managed to attract more than 3,600 investors from the Nordic countries as well as the UK, continental Europe and the US. Finally, the last major event was the launch of our physical cosmetics store Beauty by Boozt in Roskilde, Denmark at the end of March followed by the on-line launch of our beauty and cosmetics category on Boozt.com in the beginning of June. Even though the second quarter was characterised by many extraordinary events, we managed to keep the momentum. Our net revenue was SEK 496.1 million, representing a growth of 39.0%. This was the first quarter without any ECCO mono brand store sales, affecting the “other” segment negatively. 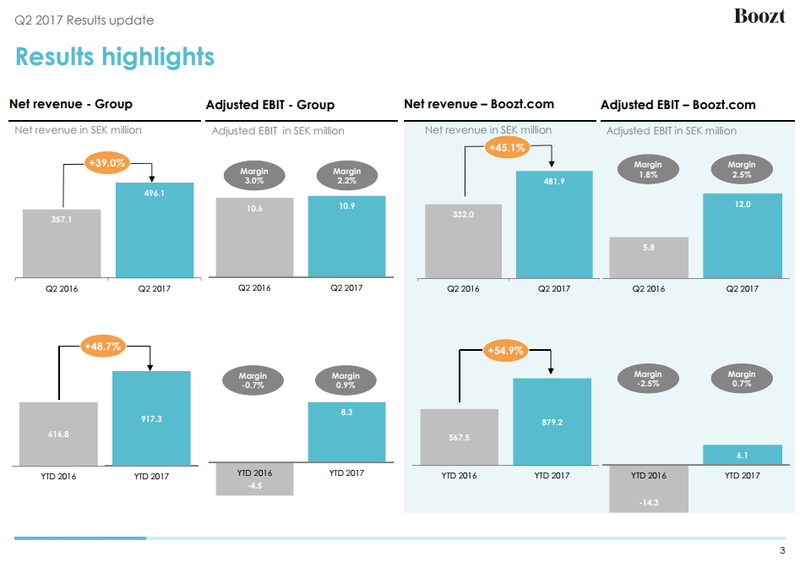 The other two segments Boozt.com and Booztlet.com realised a revenue growth of 45.1% respectively 31.4%. 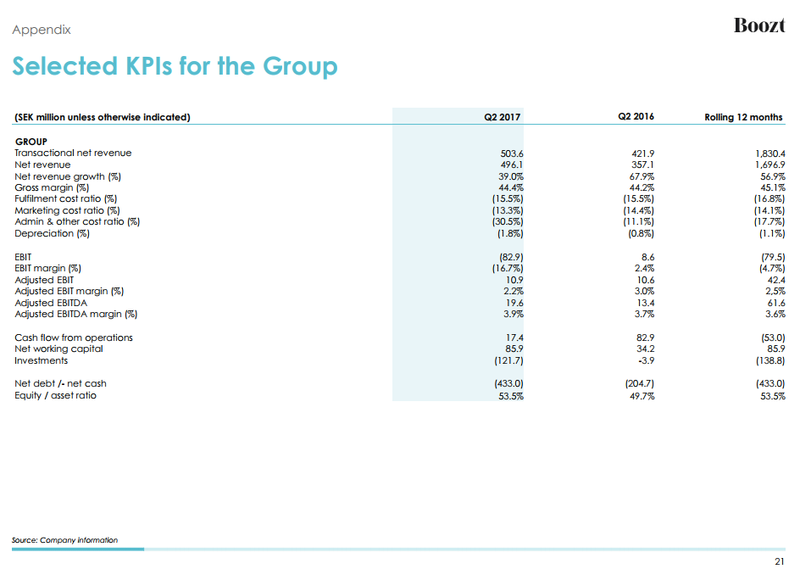 We are especially pleased to see that the profitability in our main segment Boozt.com increased during the quarter. The adjusted EBIT for Boozt.com increased from SEK 5.8 million to SEK 12.0 million, thus increasing the adjusted EBIT margin to 2.5% compared to 1.8% in second quarter 2016. For the first half of the year our net revenue was SEK 917.3 million representing a growth of 48.7%. Boozt.com grew 54.9% and Booztlet.com grew 58.0% during the first half of the year. The growth during the first half of the year can be attributed to a solid new customer intake as well as an increasing number of customers returning. The number of active customers on Boozt.com at the end of the first half of the year had increased by 31.8% compared to the first half of 2016. Hier eine Übersicht, wo Boozt im Vergleich zu About You, Boohoo und anderen Fashion-Aufsteigern steht.